I admit that I enjoy dressing up for work, but I love weekend coziness just as much. Today I wanted to share how you'll typically find me on a Saturday along with my new, fabulous glasses from Firmoo. 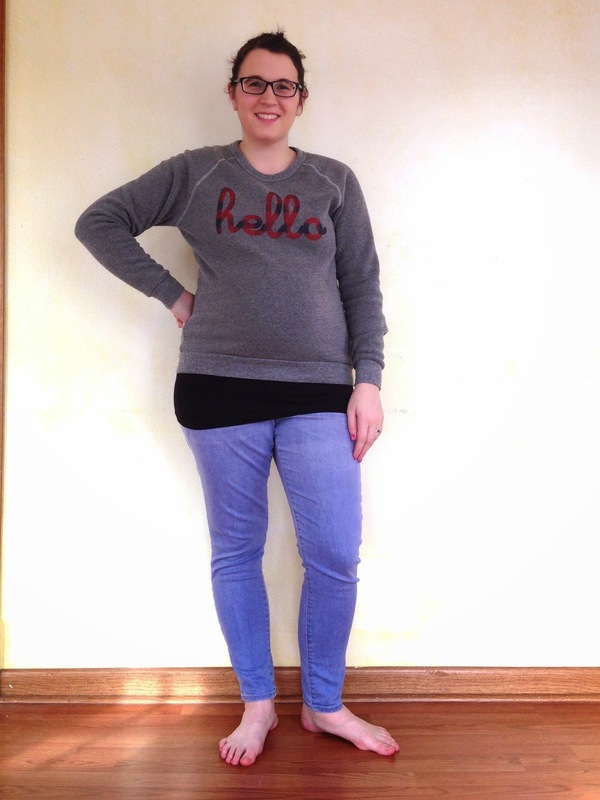 You've seen this Hello Apparel sweatshirt a few times, and you're probably like, enough already, but it's so cozy and I can wear it even with the baby belly. I stuck a long black tank underneath, and threw on my cozy Gap Maternity legging jeans. I chose these glasses from Firmoo to challenge myself a little. I usually am apt to go for brown tortoise shell. These are solid black. I love that they are simple yet stylish. Firmoo provided me with these glasses in exchange for my honest review. I am thrilled with them and would definitely order from them again. You can get your first pair of glasses free from Firmoo. Just follow this link! Linking up with Manic Monday and Let It Shine.